Jetstream HB Hardtail w/ Flame Maple Top, Other Shape Guitar from Reverend belonging to the Jetstream HB Hardtail model. 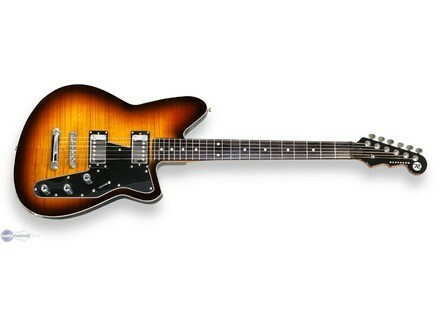 Reverend has introduced the Jetstream HB guitar with flame maple top. Part of the brand's Bolt-On-Neck Series, the Jetstream HB features two Reverend humbucker pickups, Reverend Pin-Lock tuners, Bass Contour control, block inlays and neck binding. The Jetstream HB is said to produce big, wide rock tones, but it was also designed to be versatile. The bridge pickup is slightly hotter than a vintage PAF, and the neck pickup slightly cleaner for balanced volume and tone, while the Bass Contour control (featured on all Reverend guitars) revoices the pickups, allowing you to cover a wide range of tones and styles. The solid korina body, maple top and maple neck contribute to a resonant, and lively instrument that responds to the player's touch. MSRP is $899 for an effective street price of $649. Molten Voltage Toggle Pedal Re-imagine your effects seven different ways with the new TOGGLE pedal by Molten Voltage. V-Picks releases clear acrylic pickguard V-Picks has announced the release of the V-Guard, a customizable clear acrylic pickguard for Les Paul guitars. Behringer VM1 Vintage Time Machine Behringer has announced the release of its VM1 Vintage Time Machine.